The granite crushing plant is used for crushing stone into granite sand. Granite is hard, tough, and resistant to fracture because of the interlocking structure of the minerals within, because of which we should choose the best-quality granite crusher to operate the crushing process. 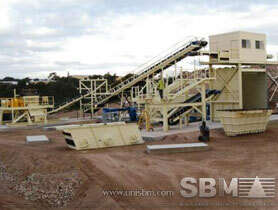 SBM supplies granite crushing production line with the capacity ranges from 50t/h to 2000t/h. SBM applies two series of granite crushers to meet the different needs under different circumstances. Cone crusher and mobile crusher series granite crushers are the ideal granite processing machines. Mobile granite crushing plant itself is a complete crushing production line and is the most available granite crushers. "SBM granite crusher can make stand alone use or as a part of multi stage processes with low cost per tonne operations and high mobility."